‘The 33’ is one of these films that gets lost under the weight of releases at this time of year with the various Awards hopefuls all receiving UK cinematic releases in January and February. 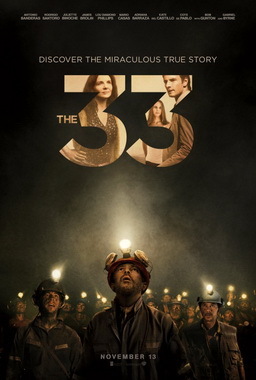 ‘The 33’, I imagine, was released at this time as a potential contender, with its true story subject matter and weighty approach, but it’s a disappointing effort that misses the mark. The film is a retelling of the events surrounding the Chilean mining disaster of 2010, where 33 miners were trapped underground for more than 2 months, with the whole drama captured by the 24 hour news cycle as families and officials did everything they could to rescue the men. There’s a compelling story to tell here, but the approach taken by ‘The 33’ doesn’t do it justice. One of the main reasons the film fails to compel is because it never knows whether it wants to be a forensic docudrama or an exciting survival/disaster movie. The film’s focus lends itself more to the docudrama approach, but then we get ramped up moments of drama that lend itself to the more exciting and tense thriller the film sometimes wants to be. The focus itself is too vast regardless, trying to capture the events underground as well as those above ground from several different perspectives (the families, the rescuers, the government) and this constant jumping about removes a lot of the tension from the drama. The tension and suspense is almost entirely underground and this is where the film is at its strongest, and it’s hard not to imagine the superior movie that focuses only on the events underground and the way this situation would start to impact the men. The performances are mostly solid, but I was continually taken out of the moment by a series of dodgy accents from the multitude of nationalities in the cast (ironically with no Chilean’s in the lead roles). It wasn’t quite ‘Child 44’ bad, but it does prevent the viewer from being fully immersed in the story. Alongside the overly formulaic script, this is another reason the film is ultimately disappointing. We know the miners survive, but the film should make us feel like they might not. Overall, ‘The 33’ is a disappointing retelling of a captivating story and I wouldn’t recommend spending any time on it.